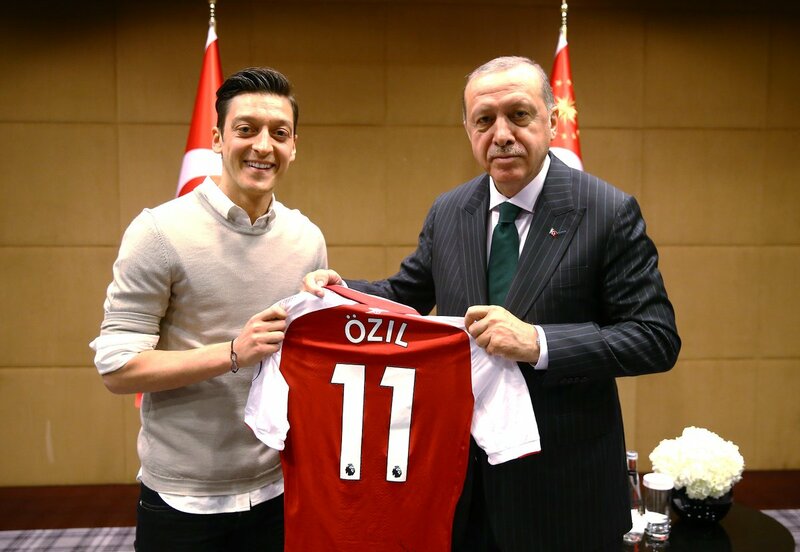 LONDON: Germany stars Mesut Özil and Ilkay Gündogan have come under heavy criticism from German politicians for posing in photos with Turkish President Recep Tayyip Erdogan. The Premier League players along with Everton’s Turkish player Cenk Tosun were pictured exchanging signed shirts with the Turkish President who is on a state visit in U.K. Following this the German Football Federation (DFB) criticised the two German-born players, both of Turkish origin, for giving Mr Erdogan signed shirts at an event in London on Sunday. Gündogan who is a key part of Pep Guardiola’s plans in Manchester City wrote: “For my honoured President, with great respect.” With a photo which irked the German parliamentarians as both Germany and Turkey exchange tense bilateral relationship. DFB president Reinhard Grindel said: “The DFB of course respects the special situation for our players with migrant backgrounds, but football and the DFB stands for values that Mr. Erdogan does not sufficiently respect. The politicians also called for dropping the star duo from the imminent World Cup squad to play in Russia for disrespecting Germany. However, DFB director Oliver Bierhoff said: “Neither one of them was aware of the symbolic value of this photo, but it’s clearly not right and we’ll be talking to them about it”. After the row surfaced Gundogan came out with a statement defending himself as well as Ozil and Tosun saying that they have done it out of courtesy to the President of their families at home. However the controversy took tense when Turkish Football Federation president Yıldırm Demirören hit back at his German counterpart. He told in a statement that: “It was very disturbing for me to read the tweets posted by German Football Association (DFB) president in his social media account, which includes detrimental statements about our President Mr Recep Tayyip Erdogan,” he said in a statement. “DFB president’s remarks are unacceptable. “It is a very well-known fact that our President Mr Recep Tayyip Erdoğan, as a former player, is a big football fan who has massively contributed to the progress of the game in Turkey. “In that sense, his meeting with Germany internationals Mesut Özil and İlkay Gündoğan as well as Turkey international striker Cenk Tosun, who are all Germany-born professional footballers with Turkish descent, is only natural.